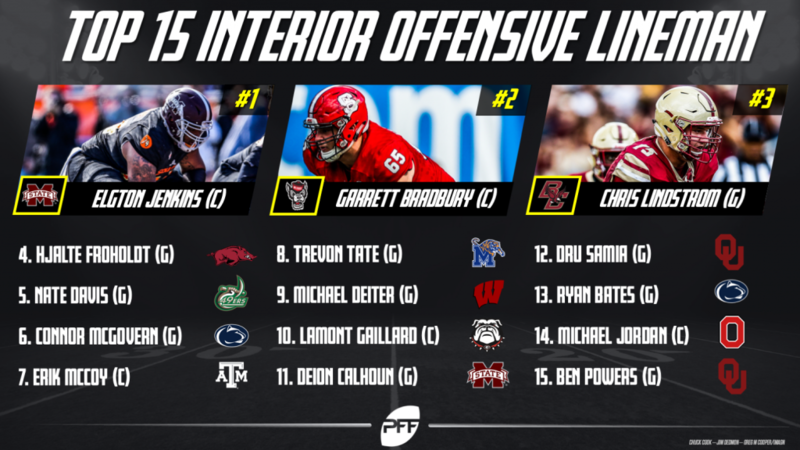 Converting a college tackle to guard may be your best bet at getting an early impact player at the position in this class, as it’s not near what we saw a season ago. Chris Lindstrom with his four pressures allowed this past season sits atop the guard class, but even we see him as more of a second-round value than a Day 1 pick. From a grading perspective, the Wisconsin duo of Beau Benzschawel and Michael Deiter offer a lot of intrigue. Benzschawel was the highest-graded guard in the draft class while Deiter has well-graded seasons at guard, tackle, and center for the Badgers. The center class often gets conflated with the guard class as the skill sets needed can be so similar. The top of the center class, though, may be the rare players who teams want at center and center only. Mississippi State center Elgton Jenkins is our top interior line prospect, and the senior looked far more comfortable at the Senior Bowl when asked to play center rather than guard. 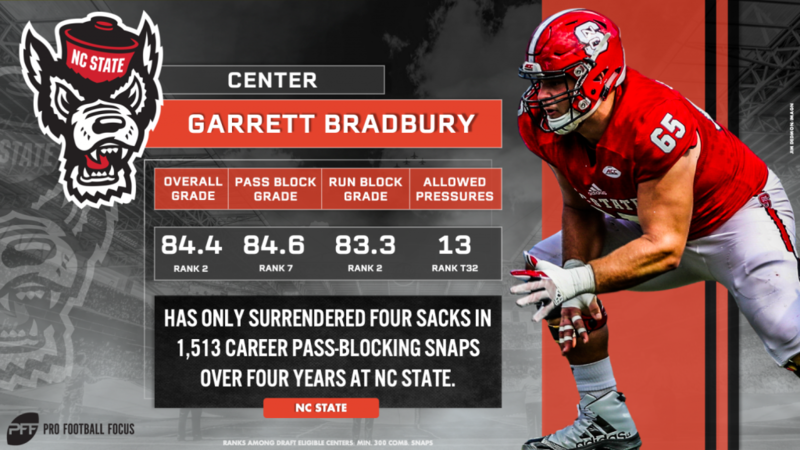 NC State center Garrett Bradbury is next up on the board and at a shade over 300 pounds, doesn’t have the frame to play anywhere other than center in most schemes. McCoy struggled a bit in the 1-on-1s at the Senior Bowl, winning only 21 percent of his pass pro reps. However, his tape suggests a player that is one of the most complete interior linemen in this class. 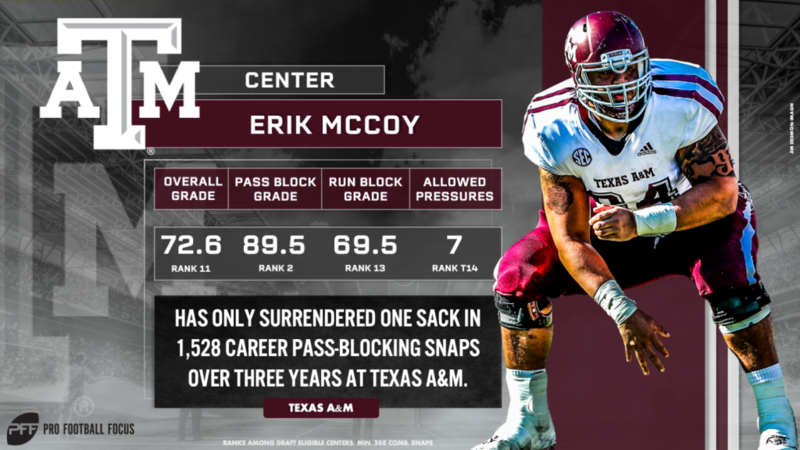 Playing 275-plus pass-blocking snaps for the Bulldogs in each of the past three seasons, Calhoun has earned 70.0-plus pass-blocking grades in each year since his 2016 campaign. A nasty finisher and coveted for exactly that, Oklahoma’s Samia has a lot of uncoachable traits that NFL coaches will fall in love with in this pre-draft process. 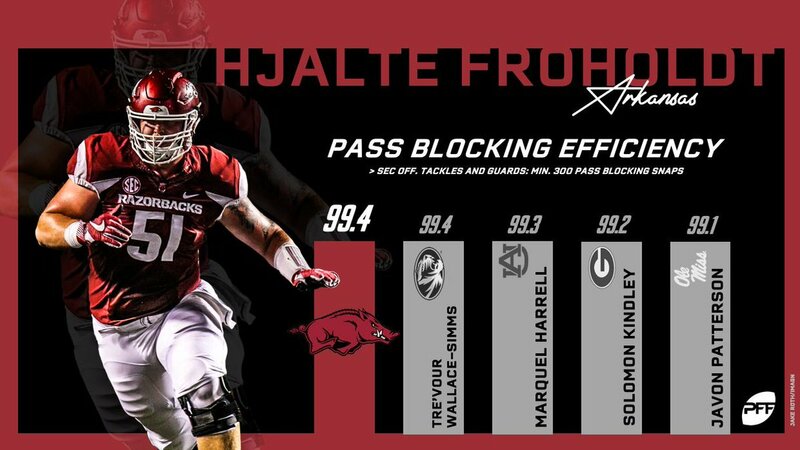 He finished his 2018 campaign ranked 34th in pass-blocking grade at 78.3.